Emiliano Sala was described as a "manager's type of player," by Cardiff boss Neil Warnock, after the Argentine striker's combination of work ethic and finishing skills had earned him a club-record move to the Premier League. Twelve goals in 19 appearances for French Ligue 1 side Nantes this season had convinced Cardiff to spend £18m on the 28-year-old in January, and Sala was eagerly looking forward to the challenge. However, Sala tragically never got a chance to perform in the Premier League - the plane which was carrying him and pilot David Ibbotson back to the Welsh city disappeared on Monday, January 21. 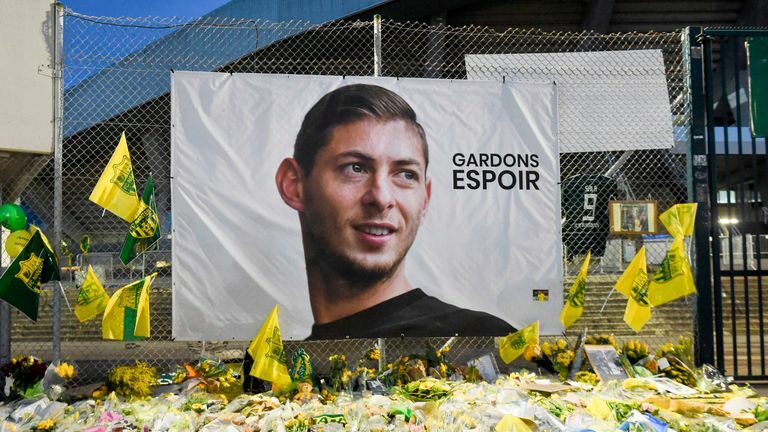 The wreckage was later found off the coast of Guernsey and police announced on Thursday night that a body which had been recovered from the plane had been formally identified as Sala. Sala is hard working, he works his socks off for the team. He's a manager's type of player. Born in Argentina, Sala, who is a native of Santa Fe, began his career as a youth player at Club Proyecto Crecer, before heading to France in 2010 where he would make his name as a powerful frontman. The 6ft 2in striker first signed for Bordeaux at 20 and made his senior debut for the club in February 2012, coming on as a substitute in a 3-1 Coupe de France round-of-16 defeat away at Lyon. However, he failed to make more than a handful of appearances for Bordeaux and, following loan spells at lower-league Orleans and Chamois Niortais, and a brief spell at Caen, where he scored five goals in 13 Ligue 1 appearances, Nantes signed the forward on a five-year deal in July 2015 for a reported €1m. During three-and-a-half seasons at the Stade de la Beaujoire, Sala scored 42 goals in 101 leagues games. Last season he played under Fulham boss Claudio Ranieri and it was Sala who handed the former Leicester City manager his first win with a 1-0 victory over Troyes. He went on to score 12 times under Ranieri, finishing as the club's top scorer as Nantes sealed ninth place in Ligue 1. The manager and his player - an easy-going, book-reading, guitar-playing, popular figure - struck up a fond relationship. "Ranieri has brought his great experience, his serenity, and an Italian style that we have seen sometimes in matches," Sala told L'Equipe last season. Their connection even saw Sala linked with a January move to Ranieri's Fulham ahead of the current transfer window. "People see the way he fights for every ball. That encourages his team-mates to do the same. He is a good example for everyone," Ranieri said of Sala last season. Despite Ranieri's departure from Nantes at the end of the 2017/18 season, Sala's impressive form continued, with only Kylian Mbappe, Edinson Cavani, Nicolas Pepe and Neymar outscoring him in the current campaign to date. Last October, Sala became the first player to score a Ligue 1 hat-trick for Nantes since Mamadou Diallo's treble against FC Sochaux-Montbeliard in 2006 and he enjoyed a warm relationship with the club and its fanbase. The Argentine scored his final goal for Nantes in December's 3-2 win over Marseille and he made his final appearance for the club on January 16, coming off the bench for the final 18 minutes of a 1-0 defeat by Nimes. Sala had stayed on for one more match to help out injury-hit Nantes for that midweek trip to Nimes before bidding a fond farewell to his coaches and team-mates on the following Monday morning, tweeting a picture of his former colleagues with a heart emoji and fatefully "La ultima ciao" - the final goodbye. But Sala was also excited to make his mark with his new club, joking 'a new Sala' was coming to the Premier League as he looked forward to the prospect of going head to head with the likes of Liverpool's Mohamed Salah. He told the Cardiff website: "I'm very happy to be here. It gives me great pleasure and I can't wait to start training, meet my new team-mates and get down to work. "For me, it feels special [to be the club's record signing]. I have come here wanting to work and to help my team-mates and the club. I can't wait to get to work straight away and do everything I can." With the club battling to avoid relegation, boss Warnock welcomed Sala's committed approach to the game. "I like him, he's a hard worker," Warnock said after the transfer was confirmed. "He's not going to knock the walls down straight away, but we need strikers. "The people we're looking at are types of players who will fit in with our squad. He is hard working, works his socks off for the team, doesn't catch the eye at times but is a manager's type of player." That work ethic took Sala to the top of the game. But as a person, he was even more fondly thought of by those who knew him best at Nantes. He was sad to leave behind his friends in the French city, and the tearful tributes which followed reflect his immense popularity.